Any aspiring pastry chef knows a fluffy donut can brighten up a winter day. But only the best donut makers can guarantee your baking quest’s success. Luckily, there is a bountiful range of models out there, from mini donut makers to automatic machines. With such a vast choice, however, picking the right appliance is often overwhelming. Yet, you needn’t worry. We’ve roamed the market and selected the most promising models. Check out our top picks below. 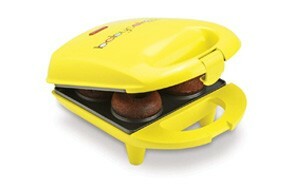 The Multi-Treat Baker by Babycakes is one of the best donut makers any foodie enthusiast will love. It has flawless aesthetics and looks great on the countertop, but its most significant advantage is its versatility. Named the Triple Delight, the multi-treat baker comes with three interchangeable non-stick baking plates ideal for making bite-size sweet and savory treats. Perfect for beginners and experienced cooks alike, this donut maker incorporates all you could wish from such a machine. 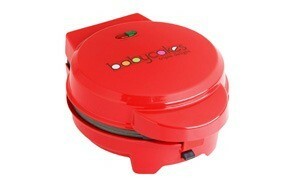 It works similarly to a sandwich maker and boasts a latching handle, cord wrap, and non-skid rubber feet. The power and ready lights will let you know exactly when it’s the time to start baking. Moreover, the baker comes with a recipe booklet packed with hints and suggestions to help you take your baking experience to the next level. 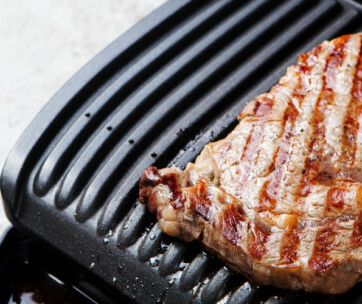 It makes a great food gift for the men who love to eat. VonShef is one of those kitchen gadgets designed to give color to your life. It doesn’t come with interchangeable plates but makes 12 mouth-watering donuts at a time. Perfect for all donut lovers out there, this mini donut maker boasts ultra-fast heat up and bakes your goodies in just minutes. One of the most exceptional features is the automatic temperature control that lets you get perfect donuts every time. You’ll also like the power and ready light indicators that let you know when it’s time to start baking and when to take your treats out. Then, twelve is just the perfect number to treat yourself or impress your dinner party guests in one go. Convenient and easy to use, the VonShef Donut Maker comes with non-stick plates. It’s easy to clean with a dish sponge and complements your kitchen with its festive red appearance. A retro-chic appliance integrates with success in any kitchen, and the Mini Donut Maker by Brentwood Appliances does precisely this. It fits seamlessly on the countertop and complements your kitchen design with its stylish pink flair. But it’s not all about the looks. This mini donut machine lets you express your cooking creativity. It makes seven delicious donuts at a time, but you can easily unleash your imagination to create various sweet or savory treats. The perfect gift for a foodie, the donut machine comes with high-quality non-stick plates and bakes donuts, cakes, brownies, and more. Ideal for family fun, it also comes with cool touch handles your kids can safely operate. No doubt, a great donut maker at a more than affordable price. With an attractive price point and the cutest look, Babycakes presents the best mini donut maker for the money. This thing is inexpensive but packs all you need to bake delicious goodies day after day. It has a capacity of four donuts, but nobody stops you from getting versatile and baking savory treats too. The non-stick baking plates make cleaning a breeze. Just spritz the surface with some baking spray before you get started, then wipe with a damp cloth when you’re done. Easy to use even by the kids in your household, Babycakes Mini Donut Maker comes with a touch-cool latching handle and non-skid rubber feet. We also appreciate the adorable look this appliance has. Its playful yellow can liven up a traditional or contemporary kitchen alike. Thanks to its tiny dimensions, it fits just right even on a small countertop, and the convenient cord wrap helps keep things organized at all times. A great housewarming gift everybody will love. The Chef Buddy Hot Donut Maker is another retro-chic donut maker machine designed to enhance your kitchen design while baking delicious goodies for your cravings. It’s perfect for a larger household or after a dinner party and cooks up to seven donuts at a time. The flawless design makes this electric donut maker a perfect gift for a foodie. Particularly attractive is the color, a purple derived from a blue and perhaps inspired by Pantone’s Ultraviolet. Ideal to place on your countertop, this donut maker has non-stick plates and an easy-open cool touch handle. Fun to use, attractive to look at, and highly performing, this kitchen appliance can easily bake you a great start for the day. 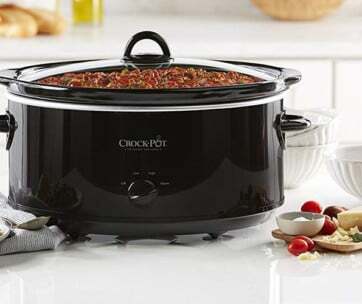 For more amazing kitchen appliances, check out our guide to the best slow cookers. Are you ready to boost your baking game and impress your guests with the fluffiest donuts and perfect Danish pancakes? Good! 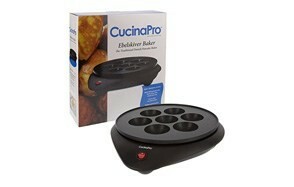 Then the donut maker and ebelskiver pan baker by CucinaPro is an essential your kitchen needs. This versatile donut making equipment serves pastry chef aspirants in more than one way. An even heat distribution makes it easy to cook seven Danish pancakes at once, while the non-stick coating makes cleaning a breeze. From donuts to pancake puffs and cake pops, CucinaPro Doughnut Maker is up to anything and handles whatever dough you’re throwing at it. A sleek, elegant look makes this ebelskiver maker easy to integrate into all kitchens. Its matte black finish inspires professionalism, so as to make your friends declare you the Donut Boss. Because who knows, you could just be the next Buddy Valastro in the neighborhood. A retro red can always highlight the beauty of a kitchen, and when the color embellishes one of the best automatic donut makers, the things take a turn for the better. The Bella Cucina Donut Maker is made to brighten up your mornings and stands by your side each time you have a craving. It is designed to make delicious mini donuts, seven at a time to be more precise. 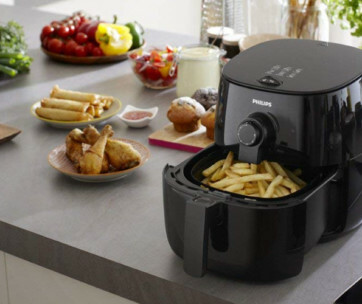 A healthier choice compared to deep frying, this machine serves multiple other purposes too. You can use it to bake delicious muffins, sweet treats, and savory bites either for yourself or for your buddies. Easy to use and easy to clean, the donut maker also has a power and a ready indicator light, a latching handle, and non-skid feet. Just what it takes to bake goodies in all peace of mind and impress your guests with your pastry skills. Our guide to the best waffle makers features more great products like this, so check it out. Resembling a closed oyster when the lid is down, beautifully colored in pastel nuances, and spacious enough to bake seven donut holes at a time, the Nostalgia Cake Pop & Donut Hole Bakery brings versatility to your kitchen. This automatic donut making machine is perfect for baking bite-size savory treats, sweets, and cake pops. It comes with non-stick trays which are easy to clean. Twenty-five bamboo cake pop sticks add even more versatility to the set. Designed to heat in a breeze, this automatic donut machine bakes in under ten minutes. Furthermore, a handy injector allows you to fill your treats with various fillings or decorate your cake pops with icing of all colors. Compact enough to fit in a cabinet when not in use and attractive enough to look good in your kitchen, the Nostalgia Bakery is one of those appliances designed to unleash your imagination and test your baking skills. Donut makers are fun-to-use appliances designed to entertain kids, adults, or the kid within you. But the truth is only the best donut makers live up to the expectations. That’s why we only included in this list those donut makers that fit into our rigorous selecting criteria. The following four factors influenced our choice. Brand - There is a never-ending debate on whether a brand is a guarantee for the quality. We know not all brands manufacture quality appliances, but some of them do. That’s why we only considered those brands renowned for using quality parts and praised for paying attention to the craftsmanship. We also examined the availability of after-sales support and the included warranty. Reviews - Who can honestly assess the quality of a product? No doubt, the users. Reviews can make or break the deal, even if the donut maker is manufactured by a renowned brand. All machines featured in our list have been positively judged by their users and declared reliable and versatile to use. Ease-to-Use - Donut makers are often used to have fun with the kids. Even when there are no kids involved, it’s still annoying to have a donut maker that requires an engineering degree to operate. The machines in this list can easily be operated by a supervised kid and are also easy to clean. A bonus for whoever has to deal with the post-party aftermath. Price - Like most kitchen appliances, donut makers come in a wide variety of styles and prices. We only chose those models that bring real value for the money. All donut makers are designed to do the same thing - bake delicious donuts and other sweet or savory treats. Beyond this, however, there are a few features to consider to make sure the appliance you like is genuinely a good fit. Capacity - Most home use donut makers vary in capacity from four to twelve donuts, although there are some exceptions. Smaller machines are ideal if you’re looking to bake donuts for just you and your better half. Twelve-donut units are perfect for parties and gatherings. Mid-size donut makers are the most popular, and typically bake seven treats at a time. Size - Size often goes hand in hand with the capacity, but not always. We noticed significant differences between machines with similar capacities, due to the design. It’s hard to tell which size is the best. After all, it’s a matter of preference. However, if you want a unit that occupies a little space on your countertop and that can easily fit in a drawer or cabinet when not in use, a compact donut maker is preferred. Design & Aesthetics - Another subjective criterion you have to weigh in. Because beyond personal considerations, the design and aesthetics of the appliance must fit in the overall style of your home. Retro style donut makers are often your best bet, as they complement most interior designs. As for the hues, there are plenty of choices. From classic red to contemporary purple and everything in-between, there is literally a rainbow of colors to consider. Ease-to-Clean - Cleaning is the daunting task that follows the cooking fun. And unless you want to spend the whole evening dealing with messes while everyone else is enjoying a board game in the living room, it is essential to buy a donut maker that cleans in a breeze. Some units have detachable dishwasher-friendly trays. The vast majority come with fixed non-stick plates that are very easy to wipe with a damp cloth. Q: Is there a difference between donuts and doughnuts? A: Besides the noticeable spelling difference, no. Both donut and doughnut refer to the same glorious baked goods so popular among the police officers… and not only. From a strictly grammatical standpoint, doughnut is the correct spelling. But thanks to Dunkin Donuts, the donut spelling became so popular that English-speaking countries all over the world - the UK included - began to adopt it. Q: What is the difference between cake donuts and yeast donuts? A: The difference lays in the way they are leavened. Cake donuts are made from a batter leavened with baking powder. Yeast donuts are made from dough leavened with yeast. The latter is the popular glazed donuts found in most donut shops. While it’s impossible to tell which is better, dough donuts tend to be fluffier and airier than cake donuts. Q: What is the best flour to use for donuts? A: It depends on what type of donuts you want to make. Yeast donuts benefit more from a high-protein flour which makes the dough more elastic and easier to handle. Bread flour is an excellent example of a perfect flour for the purpose. Baking powder doesn’t require the same gluten development as the yeast, so all-purpose flour is a better choice in this instance, as it keeps the batter smooth and soft. Q: How do you clean a Donut Maker? A: Most donut makers don’t disassemble for cleaning, and they can’t be immersed in water. Manufacturers recommend cleaning the baking trays with a damp cloth. Remove any batter residues with a cloth soaked in vegetal oil and condition the plates with vegetal oil after cleaning to protect the surface and prevent the dough from sticking the next time you bake goods.